I remember a few years ago my Husband and I were sitting down to lunch at a restaurant we frequented, to all others it would look like a normal scene; two people sitting down to eat, talking quietly amongst each other. The waiter who knew us well took our order like any other day. This is what others would view from the outside, but inside we were suffering, we were trying to eat although our stomaches were in knots. We were waiting for the hospital to call to let us know when to come back as my husbands father would soon pass away. I can vividly remember thinking, wow, anyone looking at us would have no idea of the anguish we were going through. I wondered how many people I pass in a day that are suffering? How many people am I impatient with because they weren’t quick enough in the grocery line, but little did I know they were up all night with a sick child? How many people could I have said hello to or smiled at that could have brought them a moment of kindness before they turned back to their silent battle. 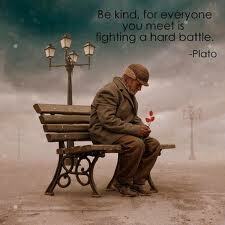 What does it really take to be kind, to slow down and smile, to be polite, to take time out for another human being? Truthfully not much at all. Today, begin the habit of compassion, it doesn’t cost a thing, it won’t take up any precious time, but the effect could be limitless. This weeks small change comes from a lack of customer service; I had called my bank to get a simple answer and after pushing what seemed to be a bunch of never ending numbers, I finally got through to customer service only to be told they were closed and to call back during banking hours. Yes, I was a bit frustrated to say the least, and I began to ponder how hard it is to get good customer service. I know that being frustrated would get me no where, so I began to think about what I could do on my end, which led me to think of my own “personal service.” check out the video above to hear my ideas on personal service, and how you can spread more goodness into the world. This week our small change is about personal service. Take a moment, slow down, and show kindness to everyone you come across during your day. Smile and say hello to people as you walk by, say good afternoon before you order your lunch, and let someone know they’re doing a great job. If everyone on this planet took time out with extra kindness can you imagine how wonderful that would be? Remember as you better yourself, you better the world.